Two new high-speed ferries to be run by Spanish ferry operator Fred. Olsen, S.A. are each to be powered by four MTU 20-cylinder 8000 M71L engines and by Kamewa waterjets from Rolls-Royce. 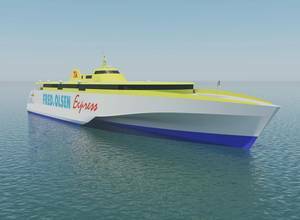 The ferries will be 117m trimarans, designed by Austal Australia, and are to ply the waters around the Canary Islands along with the world's largest aluminum fast ferry in operation, the Benchijigua Express. It is also planned to sign a maintenance agreement for both new ferries for a period of up to 8 years and a maximum of 24,000 hours of operation. The Benchijigua Express has been in service since 2005 and is also powered by MTU Series 8000 engines. Ivan Fernandez Martinez, technical manager at Fred. Olsen, said, "The Benchijigua Express is a prestigious vessel in the world of fast ferries. It ticks all the boxes in terms of our high demands for power, speed and passenger satisfaction. On the back of this positive experience we have decided to install MTU engines in our new trimarans as well. These engines will be in service round-the-clock, and we need the best possible efficiency and fuel consumption coupled with low levels of downtime. We know MTU can deliver on this. Since being launched into service back in 2005, the Benchijigua Express hasn't had a single passage canceled by engine issues." Matthias Vogel, Executive Vice President, Service, Network & Business Development at Rolls-Royce Power Systems, said, "We're delighted to have been chosen to supply the engines for Fred. Olsen's new trimarans now as well. We will continue to provide superb customer service. Our MTU maintenance agreement is a very important tool in meeting these standards. Fred. Olsen is planning to finalize a similar contract for the new vessels. By so doing, we are ensuring that expert staff, spare parts and tools will be on hand - on location - when any maintenance is required. We are also taking the financial risk for planned maintenance and unplanned downtime." The maintenance agreement is planned to run for a term of up to eight years and a maximum 24,000 operating hours. Fred. Olsen is now renewing the Benchijigua Express' MTU maintenance agreement for the third time already. The first agreement was signed back in 2004 when the ferry was still under construction. The two new vessels are being designed and built by Australian shipyard Austal which was also responsible for designing the Benchijigua Express. Ben Marland, Vice President Sales and Marketing at Austal, said, "After working together so successfully on the Benchijigua Express, we're partnering once more with Rolls-Royce for Fred. Olsen's two new state-of-the-art 117m trimarans. In all, we've now built twelve high-speed ferries equipped with MTU Series 8000 engines, plus many other MTU-powered vessels. These units boast high power density, so when coupled with our unique trimaran hull form, you get super-efficient ferry performance - allowing customers to carry more passengers, cars or trucks at higher speeds and lower cost." Each of the four engines in the new ferries will deliver 9,100 kW of power at 1,150 rpm. The trimarans will be able to accommodate over 1,100 passengers and up to 276 cars, and will be able to travel at speeds of up to 38 knots. Both ferries are to be delivered and undergo commissioning in 2020.